The two men killed by a driver driving in the wrong direction of the M62 are thought to be from Dewsbury. 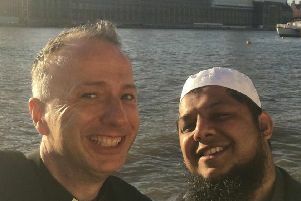 Social media tributes suggest the pair are from the Dewsbury area, but Police are yet to officially confirm the identities of the men, who were aged 34 and 37. On Facebook, Harris Pet Transport confirmed that one of their drivers was killed in the incident. They said: "Last night we lost 1 of our drivers & his friend in the horrific M62 motorway accident. Our deepest condolences to the deceased's family & friends. This is an extremely difficult time & we pray they rest in peace." They were killed after their white Skoda Octavia collided with a black Vauxhall Insignia, with police called to the scene in the early hours of Monday morning. A police statement said: "Police were called in the early hours of this morning to reports of a serious road traffic collision on M62. "At 2:34am on Monday 2 April, officers received a report of a vehicle driving the wrong way down the M62; travelling eastbound on the westbound carriageway at junction 26. "Further calls to police reported a collision on the carriageway – officers attended and located two vehicles on the motorway. "The vehicles involved were a white Skoda Octavia and a black Vauxhall Insignia. "Two males, aged 34 and 37, were found deceased in the white vehicle. "A 22-year-old man was arrested at the scene for causing death by dangerous driving and remains in police custody at this time. "There are road closures in place in both directions of the M62 whilst enquiries into the collision continue. "Anyone with any information about the collision is asked to contact the police via 101 quoting log number *212 of 2 April."